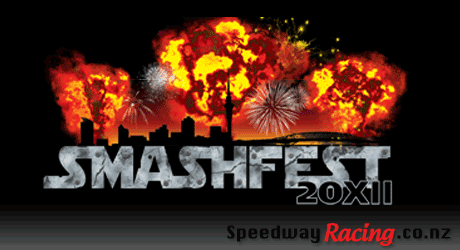 Smashfest is back for 2012! Fender-bending spectacular action including plenty of metal crunching carnage you won’t want to miss. Bring your family and friends to watch this pure unadulterated fun; or drive in the Smashfest Demo Derby and try to be the last car moving. Anyone can win. When: 6.00pm-9.30pm, Saturday 7th of April. Double Ramp Derby – Join in the carnage, or sit back and watch as participants attempt to be the last car running. Fireworks and Pyrotechnics Spectacular – Our legendary fireworks are the talk of the town. Consider the budget blown! We are here to achieve the wow factor so dont miss it. Caravan Boat & Dunny Derby Where all good holiday fun comes to an end. Watch as Caravans Boats & Dunnys are smashed to pieces. Demon Energy Monster Truck – NZ’s favourite monster truck performs some crazy car jumping madness and were told he is going to attempt the hottest jump to date! Bentley vs. Rolls Royce – Two of the finest luxury vehicle brands in the world, and were destroying them. Yes, these 2.5 tonne beasts sport upwards of 6 litre V8s. First theyll vie for best in class as they compete head to head in our ultimate car vs. car challenge, then theyll be destroyed in the Double Ramp Derby. Kidsfest Trolley Derby Well be giving away a couple of these purpose built trolleys on the night, so make sure your kids and their friends come (driver & 3 pushers) for a chance to compete like the big boys, in front of thousands of race fans. 10 cart limit. Some great bonding time with your kids or nieces & nephews.